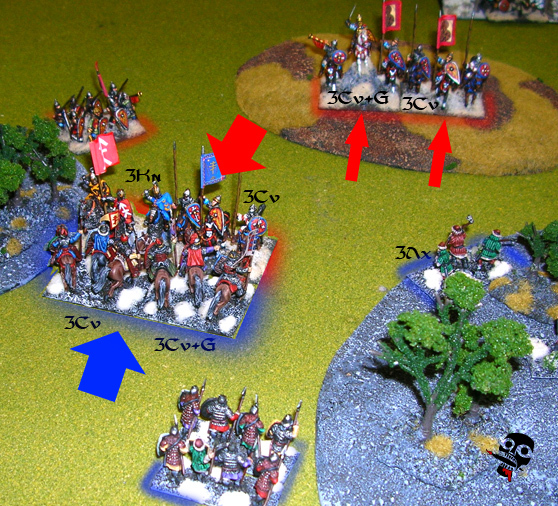 The lines close, as Mistislav (blue) and Yarislav (red) vie for the best position. With a spit and a curse, Yarislav refused Mistislav's parley and terms, as both warlords knew he would. Mistislav used the opportunity of the negotiations to move his auxiliary and skirmishing troops into and through the woods to hold up Yarislav's line. Both warlords knew that this battle would be difficult, as mounted soldiers had little chance in any battle that took place under the bows of the pine forests. As such whoever controlled the forests would likely control the battlefield as well. The armies continue to vie for position, Mistislav secures his hold on the eastern forest while Yarislav's hold on the western forest is broken. After the lines will no longer hold, battle is joined with Mistislav himself leading his host!! 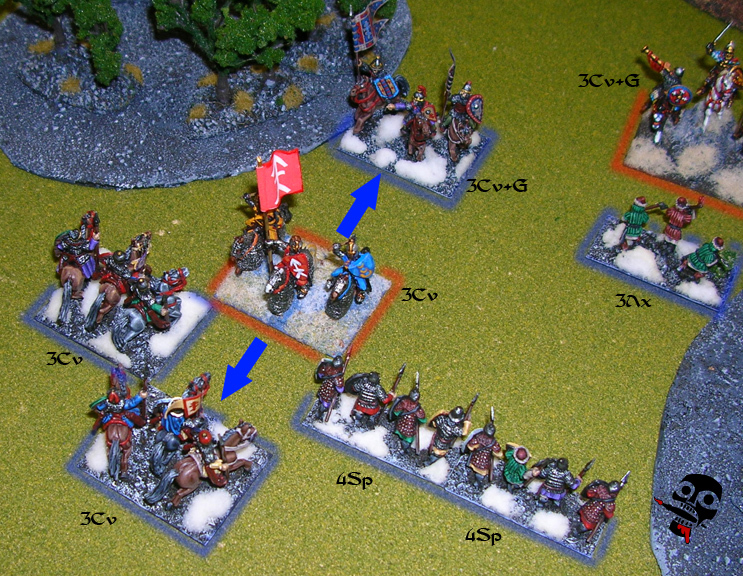 Once his position was favourable, Mistislav himself lead the charge against Yarislav's cavalry and mercenary knights. 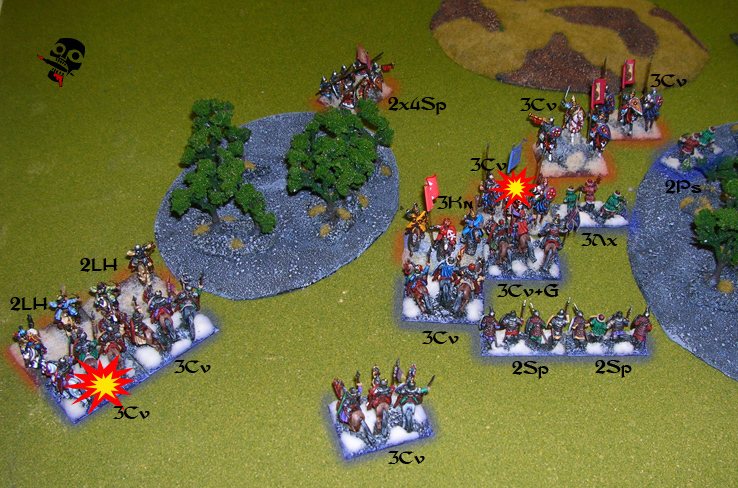 The lines clashed in a blur of wonderfully painted shields, flowing cloaks and blaring horn blasts! The battle that was made was not definitive, as the neither side destroyed the other. Despite that, the mercenary knights of Poland did drive back Mistislav's cavalry! Mistislav rides down his enemy and charges forward! The lines closed again, this time seeing Mistislav himself destroy the cavalry that opposed him, while the Polish knights continued to drive back the beleaguered cavalry to his left. During the fighting, Yarislav reformed and re-engaged as well, only to be held up once again by Mistislav's auxiliary and skirmishing forces in the woods. Not all went well for Mistislav however. 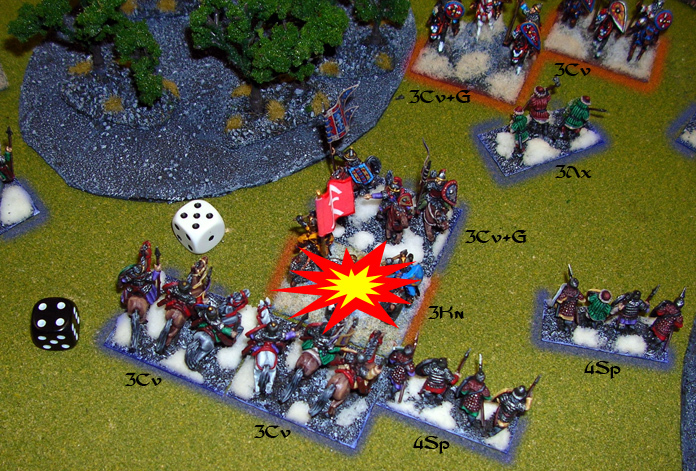 The light horse of Yarislav's army drove into the lines of Mistislav's cavalry on the left flank, destroying one element! Things looked like they might crumble there for Mistislav, because if those two enemy light horse could break away and capture his camp, the battle might end in his defeat. Fortunately, because the light horse was out of Yarislav's command range, and because of some fancy maneuvering on the part of Mistislav's cavalry, the advance of the light horse was checked for the remainder of the battle. 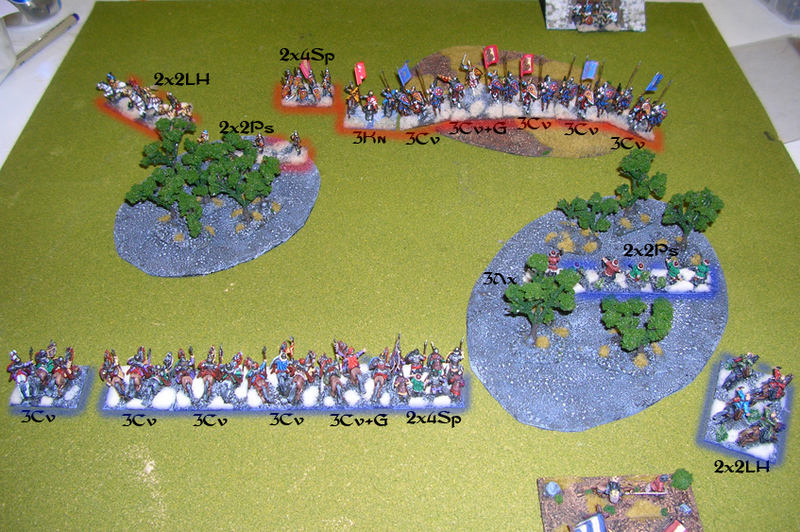 As the polish knights continued to chase their quary through Mistislav's lines, they soon found themselves far from any possible support and deep behind Mistislav's lines. Because of this, Mistislav himself battled the knights, charging to their rear while another element of cavalry as well as an element of spear also came to battle the knights. 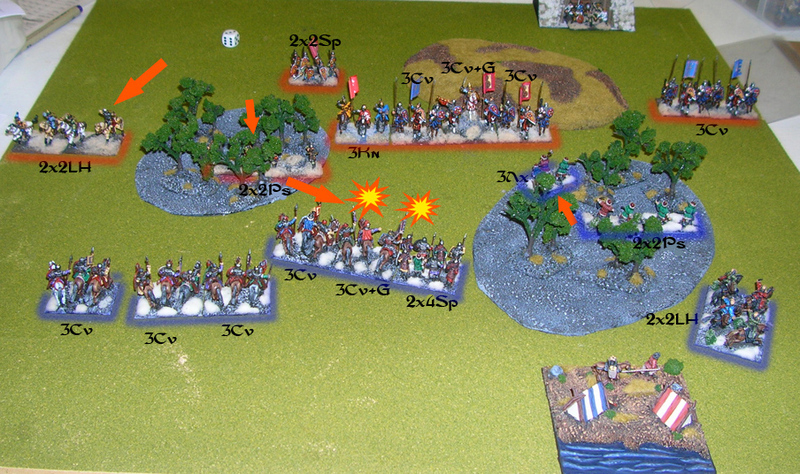 Despite this terrible show of force, the Polish Mercenary Knights of Yarislav pushed back their enemy to live to fight another day, saving Yarislav from losing the battle, as only one more element needed to go down before his army crumbled.. The brave Polish knights finally fall to the blades of Mistislav! Despite their uncanny resilience, the Polish Mercenaries finally fall to the wieght of the Russian attacks. With the destruction of the knights, as well as another element of cavalry to Mistislav's skirmishers (the cavalry were forced to recoil into Yarislav's own element when it was not properly lined up, causing them to break and flee), the battle came to a close and Yarislav lead the remainder of his forces from the field in defeat. Not only did they yield the field of battle to Mistislav, but also Novgorod! And so, it was with great trepidation that the citizens of the great city watched as their new master and warlord rode in through the gates! Would Mistislav stir them into rebellion? Or would he rule long and peacfully? Only time can tell! Thanks again to Mike for a smashing first time out with these Russians!